This page is a tribute to the Palos Verdes Sundancers. The Palos Verdes Sundancers were the ones who brought on the solar cycles . . . they first appeared near the bottom of Cycle 20 when QST was reporting the possibility of another Maunder Minimum. There was historical evidence that there was a time some hundreds of years ago when there were no sunspots for a period of about seventy years. This fact was discovered by someone named Maunder, hence the name. In order to prevent such a dire reoccurrence, the Palos Verdes Sundancers got out their grass skirts and the big bass bongo, Big DX, and danced up the sunspots every 11 years or so. The problem with the Sundancers was that after they got the flux up, they lost interest and stopped dancing! This plunged us into another cycle minimum and they had to be coaxed into doing it all over again. I like to think that each time this page is displayed, the efforts of the Palos Verdes Sundancers are multiplied, and the new cycle will take off that much sooner. Feel free to visit back often. It certainly couldn't hurt! 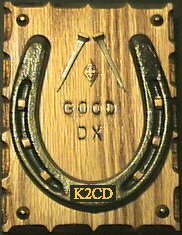 This Page Brought to you as a Public Service From K2CD on the Web.